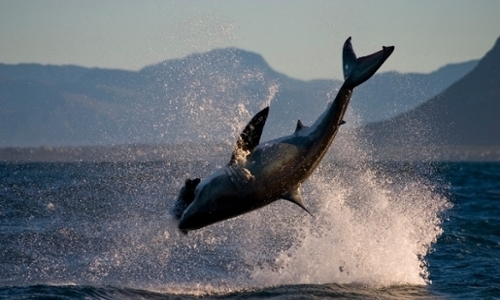 Researchers at Stellenbosch University have created an ingenious way to track great white sharks. For most people, working with sharks would be enough to make them jumpy, or at least a little bit anxious. These emotions are not what marine biologist Sara Andreotti feels. A researcher at Stellenbosch University in South Africa, Andreotti is tasked with quite the undertaking: Collecting data about great white sharks. Jumping the shark. Shark sighting just got a hand with Sara Andreotti's dynamic database called Identifin. Algorithms match dorsal fins to archived photos with an 82 percent accuracy rate. Courtesy Sara Andreotti; Stellenbosch University. To track white shark sightings off the coast of South Africa, Andreotti collaborated with an applied mathematician and a software developer from Stellenbosch University to create Identifin, a searchable database. Their research was recently published in Marine Biodiversity. “The need to identify individual white sharks made me discuss a photographic identification technique with Michael Rutzen, a world-renowned shark conservationist,” Andreotti says. Similar to how humans can be identified using fingerprints, tracking dorsal fins is a simple way to quickly identify sharks. The dorsal fin is the tall, triangular shaped fin that appears on the top of each shark; by observing notches on the fins, researchers can match the shark to one in the database. Once the photos of the sharks are collected, each photo must also be cropped and edited so the notches appear as clear as possible since the sharks are being photographed against water. The database software isolates the shark fin from the water in the background. 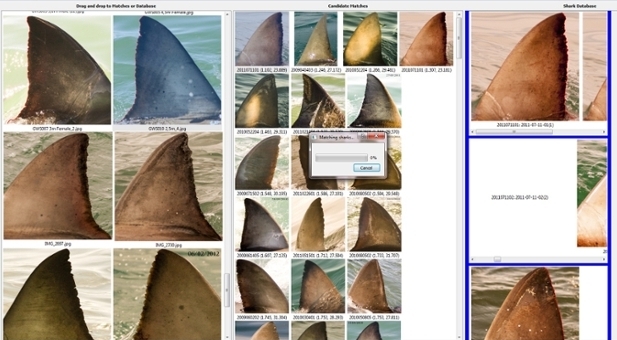 Then, using an algorithmic technique called dynamic time-warping, Identifin automatically matches incoming photos to a shark image in the database, correctly matching images greater than 80 percent of the time. Andreotti estimates that by using Identifin, the time it takes to complete her work is 1/10th of the original identification system, which was previously comprised of manually entering the photos. Andreotti says her research offers important insights about how to protect white sharks going forward. Next up, Andreotti plans to adapt the Identifin database to aid other marine species identification efforts. Identifin will allow unprecedented insight into the movement of marine species in need of protection. As in so many fields, computation is increasing the scope and abilities of conservation efforts.